Get a Whiter and More Beautiful Smile! Our professional whitening system will leave your teeth whiter and polished looking. Whiten Your Smile Today – Call for a Consultation! If you have an upcoming special occasion such as a wedding, vacation, class reunion, or holiday and you want a brighter and whiter smile fast, you can experience immediate results that make your smile shine for your special occasion. As we age, our teeth naturally stain from lifestyle and eating colorful foods. If you have certain habits such as wine and coffee consumption or tobacco use, your teeth will stain more quickly. 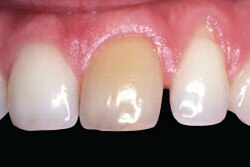 Stained or yellow teeth can make you feel self-conscious about your smile and make you appear older than you are. Restoring your smile to a bright white appearance can give you added confidence. Teeth whitening is non-invasive, affordable, and easier than ever. At Maria Kim, DMD, we offer two whitening systems: our custom take-home trays and our in-office professional whitening system. When it comes to bright smiles, Dr. Kim has helped many patients in Arcadia turn their yellow teeth white! Do I Have to Get My Teeth Cleaned before I Whiten? Why Can’t I Just Use a Whitening Kit from the Store? At our Arcadia, CA dental office, Dr. Maria Kim can guide you through the various factors that contribute to darkened and stained teeth and if you are a good candidate for professional teeth whitening. The most effective way to achieve a whiter smile is with our Zoom! professional whitening system. Our system includes two steps to first brighten, then maintain the appearance of your smile. At your appointment, we will place whitening gel on your teeth and activate it with a special UV light for approximately twenty minutes. We repeat the process several times during your appointment until you reach your desired shade. In many cases, you can achieve up to eight shades of improvement during your appointment. Your personal results will depend upon your teeth and the level of staining present. We will send you home with custom teeth whitening trays to continue the teeth whitening process and for touch-ups in the future. This two-step system guarantees the most reliable results for a brighter, whiter smile. Freshly whitened teeth go hand in hand with a clean smile. If you want perfect results, it’s important that your teeth are polished of plaque and tartar build up. Teeth whitening gel cannot penetrate plaque build-up, which is why it’s important to go through a complete exam and cleaning before the dental procedure. Teeth whitening popularity has skyrocketed in the last few decades, and many companies are jumping on the bandwagon. Consumers can find whole aisles devoted to products that promise easy and cheap results at any grocery or drug store. The problem with many of these products is that some of them aren’t very effective, while others contain abrasive ingredients that actually damage your enamel – making your teeth even more discolored than before. Unless you understand how to distinguish effective and safe products from harmful ones, you’re better off letting your professional Arcadia, CA dental staff provide you with effective and safe whitening kits. Once your whitening sessions are complete, Dr. Kim will provide you with your unique, custom-fitted whitening trays along with a whitening gel syringe big enough for three whitening applications to use at home, along with a Relief ACP Oral Care gel syringe in the event of tooth sensitivity. You don’t need to use more than a small dot of gel in the trays, Dr. Kim will carefully go over instructions for length of time and how often you should use the trays. With just a few, easy treatments in your home, you can achieve the same results as in-office treatments. Teeth whitening is safe for most healthy patients. Some patients, especially those with gum recession, can experience sensitivity. You can eliminate this problem by reducing the amount of time and frequency with which you whiten your teeth. Fluoride treatments and desensitizing products can help you have a whiter smile – comfortably. Getting your teeth professionally whitened in our Arcadia, CA dental office is non-invasive and safe. As far as dental procedures go, this is the safest and most convenient. You can keep your teeth white by avoiding staining habits such as tobacco use, coffee consumption, and red wine. Regular brushing and flossing along with professional dental cleanings will also keep your smile looking white. Maintaining your beautiful, bright smile is as easy as basic maintenance. You can continue to whiten your teeth several times a year to keep your smile looking its best. Teeth whitening should be deferred until after pregnancy or lactation, as some of the main ingredients may not be safe. People who have sensitive teeth or gums should consult with their dentist prior to doing this professionally or at home. Any allergies to peroxide should not consider using a bleaching product and should be disclosed during your initial consultation. If you have gum disease or worn enamel, this procedure may not be right for you. Dr. Kim can work with you to getting your smile back on track to be healthy enough to support further dental procedures. As with gum disease, cavities need to be fixed before going forward with the whitening dental procedure. Your Arcadia, CA dentist will complete a thorough exam prior to discussing your whitening options. Tooth-colored fillings and crowns do not whiten like natural teeth, so using a whitening bleach agent on the surrounding teeth may result in uneven whitening. If possible, it’s best to do your teeth whitening before moving forward with tooth restorations in order to match the shade. Consult with your dental professionals at Maria Kim, DMD to understand your choices. To find out more about how our take-home or in-office teeth whitening system can improve your smile, contact our Arcadia, CA dental practice today to schedule a teeth whitening consultation. We look forward to helping you achieve a bright, beautiful smile you feel proud of. You deserve the smile of your dreams! Ready to Learn More about Teeth Whitening? Teeth whitening can take up to four weeks depending on the natural shade of your teeth. If you're considering whitening your teeth for you big day in June, come in for a consultation appointment today to make sure you have enough time to properly whiten your smile. Learn more about the ideal teeth whitening for summer weddings. If you are getting married in the summer, don't wait to come in for a consultation. You may have some sensitivity afterwards - this varies depending on the patient. We recommend using desensitizing toothpaste while going through the whitening process to minimize sensitivity. Our office also provides a special gel to use at home for sensitivity. Visit your whitening dentist, Dr. Maria Kim, to help brighten your smile! For more information, read through our teeth whitening consent form. Drinking coffee, and just about any other dark beverages (red wine or tea) will definitely stain your teeth over time. We still suggest our teeth whitening products for coffee drinkers. Once you whiten your teeth in our Arcadia, CA dental office, we send you home with trays so that you can touch up your teeth whenever you like. We sell additional whitening gel in our office for whitening at home for as long as you would like! If you are interested in whitening your teeth, contact our office today! We will set you up with a consultation to check the overall health of your teeth and work on getting your whitening trays. This depends entirely on the patient as well as their diet. Patients that drink lots of dark foods and beverages such as red wine, coffee or tea will experience faster darkening of their teeth. After receiving in-office whitening, we send our patients home with whitening trays for touch ups to maintain the white shade of their teeth as long as possible. For more information, please see our teeth whitening form here. Will Your Teeth Be Sensitive After Whitening? We get asked this question all the time: will my teeth be sensitive after getting them whitened? Check out this new video of our dental assistant as she describes her experience with our Zoom! Teeth Whitening System! Getting Married? You Should Think About Whitening! Getting married soon or attending a wedding? You should start thinking about professional teeth whitening now, because teeth whitening results depend greatly on the current shade of your teeth.